Today we hear about school violence, bullying, cyber-tragedies, teens hurting teens, and more. Do we need a tragedy or the news to remind us to be nice to each other? Do we need another teen suicide to help us better understand that sticks and stones can hurt your bones, but words can also break your spirit and your bones. Emotional damage that needs to be addressed before it escalates to a bad ending. April Showers is a film that will take you through the horrific events of a school tragedy through the eyes of a survivor. Based on actual events, this film acts as both a tool and a story to help educate parents, teachers, teens, kids and anyone working with children. This excellent film outlines how bad things can happen to good people. How no one is immune to tragedy, however everyone has an opportunity to make a difference and make their school and community a safer place. One of the last lines in the film is, “I’m sorry, I just always thought we had more time….” Don’t wait until you are saying this line. Be proactive; learn about school safety and take the time to be a friend to someone who needs one. Your can order April Showers on Amazon, Netflix, and most places were DVD’s are sold. Learn more about School Safety Partners. 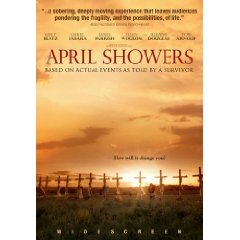 Visit the official April Showers website at http://www.aprilshowersmovie.com/ and be sure to watch the trailer and follow them on Twitter @AprilShowersMov.